Lemon facts, an information sheet for kids cooking activities. 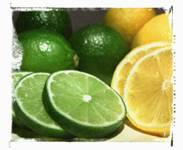 Lemon facts and lime facts with general information about lemons and limes. Lemons grow on a tree as well as limes in warm weather areas. Look for lemons that are bright yellow and firm. Avoid soft or mushy fruit when you press them. Look for the same qualities in a lime but a nice green color. Store at room temperature or in the fridge for longer storage. Use lemons or lime soon after cutting. Use the grated peel in cooking or baking. Use juice to prevent apples and other fruits from turning brown. Use juice for sauces, in marinating meats or in salad dressings. Make lemonade with a mixture of lemons and limes. Lemons and limes are a great source for Vitamin C.
Mix all ingredients together. Use as a marinade for meats. It's also great for marinating chicken. Allow the oven to preheat to 375 degrees and lightly grease a 5 cup baking dish. Beat together the butter, lemon rind and sugar until light and fluffy. Add the egg yolks and the flour and beat until well blended. Gradually beat in the lemon juice and milk, beating as you add. The mixture will look curdled. Place the baking dish into a slightly larger roasting pan. Fill the roasting pan with enough water to reach half way up the sides of the baking dish. Bake 45 minutes or until the top is golden brown.